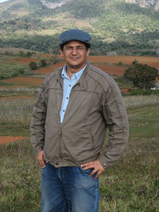 Humberto Ríos Labrada, a PhD with Cuba's National Institute of Agricultural Science, runs a program for local farming innovation. It's his job to convince farmers to plant diverse crops without chemicals in a centralized economy that tightly controls what can be planted and when. Ríos is credited with creating a program that spread to 55,000 farmers, which increased access to seeds and helped growers find more environmentally friendly ways to plant their harvest. His award comes as Cuba's agriculture industry struggles to slide out of a crisis that forces the government to import 60 percent of the nation's food. He believes food production statistics are underreported, making the food crisis seem worse than it is. Six winners from each of the inhabited continents are chosen each year; Ríos represents islands and island nations. Other winners in the Americas include Randall Arauz, who campaigned against shark finning in Costa Rica, and Lynn Henning, a rural Michigan farmer who exposed polluting practices of concentrated feeding operations. Cuban farming struggled since the start of the revolution. Experts blamed an over-centralized agricultural system that gave farmers little freedom over the land. The country's immense state farms were dealt a blow when the Soviet Union collapsed, because suddenly, Cuba had to learn to grow crops without the benefit of agrochemicals. Now Cuba is even going back to old-fashioned oxen as a way to reduce the need for fuel-driven tractors, which degrade the land. ``Cuba is probably the largest, most significant experimenter in organic farming in the world,'' said William A. Messina Jr., an expert on Cuban agriculture at the University of Florida. Messina, who is unfamiliar with Ríos' work, said most Cuban agricultural scientists never make it out of the office, so Ríos' method of using folk songs to teach farmers about biodiversity could be a clever way to spread his research. ``He sounds like a Cuban Johnny Appleseed,'' Messina said. Ríos said he's written academic articles that have gotten hundreds of hits on the Internet. Ríos said he hopes to use his prize money first on a great bottle of Cuban rum, and then on funding the next phase of his project: creating a national network. But prize organizers acknowledge that they still haven't figured out if Washingtonwill allow the wire transfer.